This traffic sign warns you that the road ahead is not as wide as the road you are currently traveling on. The "ROAD NARROWS" sign is frequently used along with other warning signs that provide additional information regarding the danger, such as "LANE ENDS AHEAD" or "LANE ENDS MERGE". NOTE: the sign does not require you take any immediate action, so don't hit your brakes just yet. 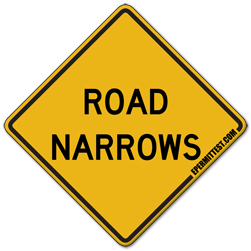 When you see a sign that says road narrows, you should evaluate your current position and whether the sign may affect you. For example, if you are traveling on a multi-lane road, the lane you are currently driving in may continue on, while the lane on the right from you may end. In this situation, you should prepare for cars merging into your lane and act accordingly, keeping the same space cushion around your vehicle.